Now in the 9th year! Hundreds of sold-out performances! 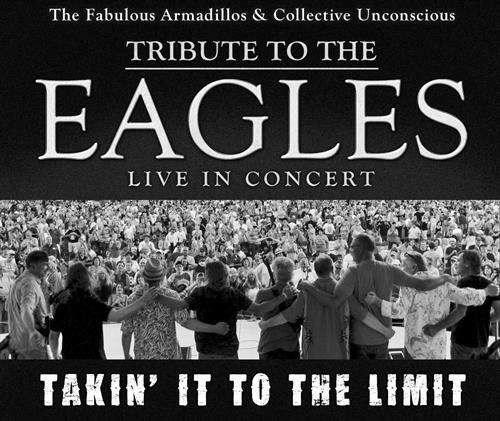 The Fabulous Armadillos and Collective Unconscious come together to recreate the magical songs of the premier band of California Rock in the 70’s, the Eagles! You will hear all the hits and relive the thrill of your turntable spinning those incredible albums! With this 9-piece band you can sit back, close your eyes and feel the energy of the Eagles live, reproduced precisely by the Fabulous Armadillos and Collective Unconscious. Groove to Take It Easy, Lyin’ Eyes, One Of These Nights, Desperado, I Can’t Tell You Why, Witchy Woman, Hotel California, Take It To The Limit, and so many more!